I've started a Franky Mode 4 Development page. Its main goal is to encourage new developments for Franky Mode 4 rather than just conversions of existing Sega Master System titles. It contains tools to convert SC5 pictures to Mode 4 tiles. Future releases will most likely include tools like tile and sprite pattern editors and editors for the name table and sprite attribute tables that will use Franky to display the result on. The site will also contain a list of links to third party tools (these may be running on systems other than MSX) that can be used to create tilesets and sprites for new developments. Some time ago a patch for an improved version of R-Type was released. However, that version did some changes to the game that may have given it a lighter interrupt handler, but it also tended to regularly crash during the game with MSX-MUSIC detected. This version comes in an additional ROM image that requires the original game to run and start the game via a menu. It's available in the download section of my Home Page. The Super Latok and Level options can only be modified when the Debug Menu was loaded from Game Disk 2. Be sure to re-insert the correct disk before leaving the Debug Menu. The End Demo option is only accessible when the Debug Menu was loaded from Disk 5. Be sure to re-insert the correct disk before leaving the Debug Menu. This also applies to the GoGo Pixie minigame in The Tower of Cabin. I've released an updated version of FIXBOOT. 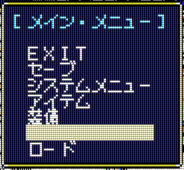 It fixes a small bug that caused disks/paritions with the dirty disk flag set not to be corrected and adds the option to force the Volume ID to be according the MSX-DOS2 specifications. This only works on FAT12 paritions. The audio exits 2-way, to the MSX via de cartridge slot and via de 15-pin SUB-D (VGA connector), which has the same pinout as the ESE3 for convenience purposes. Right now many Sega Master System titles can be played when they get converted while the game files get loaded. Some titles have been converted manually already as the automated converter has problems converting those.